You can start this exercise when you have reached the Grade One standard, and when you have steadied up your dog. You can’t cast a dog effectively if he cannot sit still and watch whilst you chuck dummies all around him. For many people, this is where the fun begins. You are moving on from all that ‘boring obedience’ work and starting some real retriever training. [wp_ad_camp_1]Teaching the dog to discriminate between left and right ‘casts’ is usually a straightforward task, provided that you follow a few basic rules. However, don’t forget that it is important to keep working on your obedience and not to let this slip in favour of the fun stuff. Starting each training session with some crisp heel work and a few ‘stays’, if done on a daily basis, will help you keep your progress on track in that respect. It is also worth remembering that dogs are often more keen to participate in these kinds of exercises when they are fresh, so don’t wear your gundog out with a half marathon, before you begin. The purpose of this exercise is not just to teach the dog what your right and left hand signals mean, but to introduce him to an important concept. He is going to learn that retrieving is not just a case of watching something fall and waiting to be allowed to fetch it. It is about working as part of a team. From now on, there will often be more than one retrieve. There may be two or three in succession. And YOU are the person who gets to choose which one he fetches first. Only when he looks at YOU and pays attention to YOU does he get the information he needs. From now on he needs to become a team player. There will be choices, and you will be making them. If he watches you and follows your instructions he will get to have a whole lot of fun. You do not need to spend weeks on this basic skill. Remember that ‘drilling’ can be boring. Get this concept established, and move on to more interesting and varied work. The retriever working at a distance is controlled by hand signals and whistles. Your whistle tells the dog to stop and look at you, and your hands tell him which way to go. It really pays to have a little practice of your casting signals, in a mirror, before you start training. Remember dogs have less visual acuity than we do. He needs to be in no doubt what your intentions are, and sloppy signals are confusing for the dog. This is not an exercise in hunting. We don’t want the dog wandering all over the place. The object here is to sit the dog and cast him to a mark, or a memory mark, so that he knows exactly where it is, and runs in a nice straight line right to it. To help keep him running nice and straight, we can use a barrier and run the dog alongside it. Your barrier can be a hedge, fence, wall, or the side of a building. It doesn’t matter which. Just make sure you use a barrier of some kind. Run the dog on short grass or bare ground and use bright or white dummies, so that he can clearly see each dummy. Just before you throw each dummy, blow your stop whistle. This is for two reasons. Firstly to underline the fact that the stop whistle is a great thing, and secondly to deepen his conviction that it is totally worth looking at you, whenever he hears that whistle if he wants to have any share in the fun. The following exercise is taken from Passing Grade Two – you’ll notice that it contains extra steps to ensure that your young dog remains steady and does not react to these first casting sessions by running in. It is well worth including them. Sit the dog up against a long barrier so that he is facing you and take a couple of steps back. Throw a dummy a short distance to your left and wait for ten seconds. Now, keeping your arm straight, make a strong sweeping signal to the left. Your dog has been well schooled in steadiness, and it is just possible he may be confused by his new position relative to yours and unsure as to whether he should move. If this happens, repeat the signal accompanied by an exaggerated step towards the dummy and encourage him to ‘fetch’ in an upbeat enthusiastic manner. Repeat 1 to four until the dog runs out keenly to retrieve the dummy. Repeat 1 and 2 but collect the dummy yourself. Repeat 6 four more times. You collect, he sits still. Complete the session by going through 1 to 7 again. Bring him out away from the fence and throw a couple of dummies over his head. Collect them yourself. He must not move. That is enough for the first session. Consider his reactions. Was he calm throughout? Did he grasp the hand signal straight away or did you need to make an exaggerated display of encouragement to get him moving? If he grasped the signal straight away, did he seem on the verge of moving as you threw subsequent dummies? If this is the case you will need to maintain this high ratio of your dummies to his for a while longer. Q Will your dog collect a dummy to his left with enthusiasm on being given a single left hand signal with no extra encouragement or verbal command? Q Will your dog still remain seated and calm whilst you throw dummies all around him? In your next training session you will repeat steps 1 to 10 but to right hand side of the dog, and using a right hand signal. Q Will your dog collect a dummy to his right with enthusiasm on being given a single right hand signal with no extra encouragement or verbal command? We have taught the dog that each hand signal is associated with moving in a particular direction. We are now going to ask the dog to obey our new hand signals and to do that we will put out two dummies, a right and a left, and ask him to collect the dummy of our choice. It is important to remember that the dog’s desire or instinct is to go for the dummy most recently thrown. In requesting him to do differently, we are asking him to obey us rather than follow his own desires. This is difficult for him and we want him to succeed so we will make it as simple as we can to begin with. The dummy the dog wants to collect is the one that fell last of all. The ‘fresh’ mark. Sit the dog up against a fence or wall. Throw the memory mark about ten yards to the left of the dog so that he has to run along the fenceline a short way to reach it. Make sure he watches you throw it. It should not be obscured in any way at all. Return to the dog and praise. Now walk out to the dog’s right, far enough to allow you to throw the ‘fresh mark’ about 20 yards from him. Send the dog for the memory mark to his left with a broad sweeping hand signal. If the dog appears to have focused his attention on the ‘fresh mark’, then before you send him, you can give a firm ‘leave that’ command and ensure he has focused back on you before giving your hand signal. If necessary make an exaggerated movement towards the memory mark to encourage the dog towards it. As soon as the dog sets off, step forward to the fenceline to block the dog should he decide to take in the second dummy on his way home. After taking the dummy, praise the dog and reseat him in the same place. Return to your position in front of the dog and send him to the other side for the second dummy. Over the next few days you will be able to build up the distances over which you send the dog to either the left or the right. Work your way up to twenty yards in either direction. Vary the order in which you send him for the dummies. Keep him guessing. Occasionally send him for the ‘fresh mark’ – the ‘memory mark is even more demanding when you do this. When he is competent in either direction with your hand thrown dummies, introduce an assistant to throw for you from time to time. Remember to limit the number of times you practice this and any other retrieving exercise. The objective is to stop whilst the dog is keen to continue. If in your efforts to perfect a skill, you continue until he is bored, you will have created a serious problem. 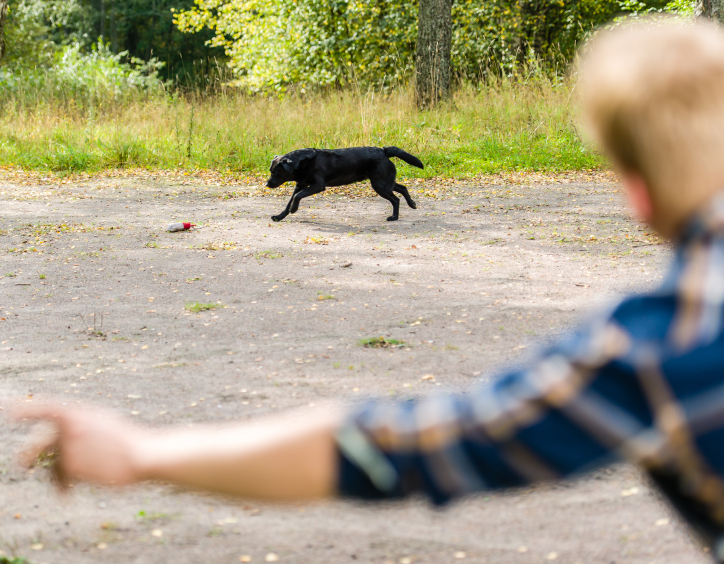 Your new handling skills will be of no use if the dog loses the desire to retrieve. Your next step is to increase the separation between you and your dog at the point when you give the command. Over the next few sessions, once you have thrown out your dummies, step back a little further each time from the dog. Keep increasing the gap until you are sending him to retrieve whilst standing ten yards from him. Your final task at this stage is to help the dog to generalise his new found skill to apply to a variety of locations. You will need to find as many places as you can with a natural barrier along which the dog can run, in order to practice your new commands. Each time you go to a new location, especially the first time, make your first few directional signals from very close to the dog and then work out again to ten yards. Be aware that increasing distance between you and the dog has great potential to erode the control you have over him. Q Will your dog retrieve from either the right or the left on your hand signal up to a distance of 20 yards or more? Q Will he do this in a variety of locations? Q Is he still quite steady to all dummies thrown by yourself or an assistant? If you would like to read more of Passing Grade Two, you can buy a copy from the Gundog Club book shop.